Probably J. J. Angerstein (b. 1835), Weeting Hall, Brandon, Norfolk. 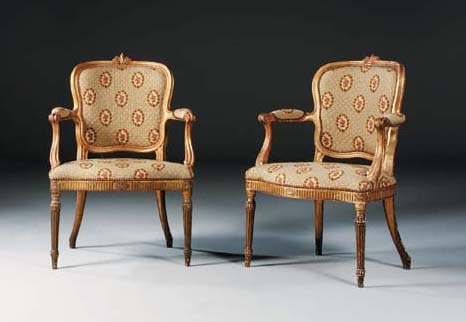 These elegant chairs, designed in the George III French 'cabriolet' fashion, have their arched crestings flowered with palms, while Venus-pearled medallions are tied to the seats by flowered and antique fluted ribbons. Related chairs supplied by the Swallow Street cabinet-makers and upholsterers Messrs. Gordon and Taitt for Audley End, Essex, were designed to harmonise with a table executed to a pattern in 'the taste of the Ancients' that had been supplied in 1769 by the architect Robert 'Bob the Roman' Adam (d. 1792) (J Cornforth, 'Audley End, Essex', Country Life, 27 December 1990, pp. 30-33). However the present chairs, with their fluted columnar legs wreathed by reed-enriched ribbons, relate more closely to a medallion-backed suite supplied at this period for Cobham Hall, Kent by Messrs. Mayhew and Ince of Golden Square for the 3rd Earl of Darnley (d. 1781), a patron of the firm since 1760 (see J. Cornforth, 'Cobham Hall - III', Country Life, 10 March 1983, p. 571, fig. 10). The rest of this suite was sold anonymously, in these Rooms, 19 November 1992, lot 104 (£52,800).